He lists many benefits of having U.S. citizenship (in comparison to having a Green Card). These include the benefits of: “No more paperwork” and “Emotional Benefits”. 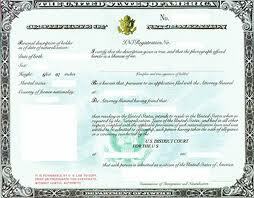 It seems to me that having U.S. citizenship means a life of paperwork and living in terror of the IRS. In fairness, I appreciate that he is comparing the benefits of citizenship to having only a Green Card. On the other hand, (depending on how long you have had the Green Card) it may be easier to cut ties with the U.S.
By way of clarification. This (in my opinion) does NOT mean that those who became Canadian during the 70s are automatically U.S. citizens. What it DOES mean is that those who lost their U.S. citizenship during the 70s have the right to get it back if they want. This entry was posted in Uncategorized on November 24, 2011 by renounceuscitizenship. “For US expats living in Canada who want to pursue the backdated Certificate of Loss of Nationality (CLN) option, it apparently is possible to obtain such a thing. Ms. Anderson of the US consulate in Toronto has agreed with my (somewhat expensive) US lawyer that on the basis of my affidavit evidence submitted to date and subject to appearing before her and explaining the situation, she sees no problem in issuing a CLN bearing a date in 1984, when I took the oath of allegiance to Canada in the belief that in so doing I was relinquishing and did intend to relinquish my US citizenship. It’s not a done deal yet but they are not giving us an especially hard time. This solution will not apply to everyone. First, you must have genuinely intended to relinquish your US citizenship in taking up foreign citizenship. Second, all your actions since the date of that expatriating act must be consistent with that intention — e.g, you have not traveled on or even possessed a US passport, you have not attempted to assert US citizenship for your children born outside the US to you when you were still a US citizen, you have not voted in any US elections, you have not filed US tax returns, your have not worked in the US or lived there for any length of time. All these are true of my situation, and I can honestly say that I did not consider myself a US citizen since 1984. I am not renouncing my US citizenship but instead asking for official confirmation of an historical fact that I lost it in 1984.